Persistence Market Research has developed an in-depth forecast report on the global market for fortified sugars for the assessment period, 2017-2026. The report delivers a detailed prognosis on how the production and demand for fortified sugars will evolve in the immediate future. The report foretells key prospects encompassing the future of fortified sugar market by supplying objective information in the form of market size estimations and qualitative insights. Presumptive scenarios on market growth offered in the report reflect the latest industry trends and the potential future challenges for manufacturers. By incorporating a collaborative research approach, this forecast study traces the evolution of fortified sugars and tracks the emergence of market players. In this research study, a slew of factors have been addressed and analyzed to assess an accurate forecast on expansion of the global fortified sugar market. Production techniques, and their association in lowering the manufacturing costs, boosting the productivity and widening the profit margins have been examined. New fortification technologies emerging in the food industry have been gauged to understand their market penetration potential for the forecast period. Global fortified sugar supply chain has been analyzed thoroughly, and leading distributors of fortified sugars have been categorically ranked. Lucrative markets for cost-effective procurement of raw sugar and other fresh micronutrients have been identified. Valuable information across such levels have been provided in the report, the availing of which is of great advantage for fortified sugar manufacturers based across the globe. In order to cater to the concerns of global market players, the report has been developed by procuring information derived from constant dialogues conducted between analysts and leading producers. This report explores every major business function associated with production and consumption of fortified sugars. The report further delivers objective assessment of buyer-seller landscape in the global fortified sugar market. By representing the researched data and analysis in the form of a systematic data collection document, this study holds the power to deliver credible information of target consumers, competitive environment, strategy-oriented undercurrents, and estimated market evaluations. Key sections of the report provide segmental analysis & forecast on the global fortified sugar market. The report has segmented the global fortified sugar market on the basis of micronutrients, technology, end-users, and sales channel. Country-based expansion of the global fortified sugar market is also provided in the report. Additional information on cross-segmental analysis is another key feature of this forecast study. Industry specialization methods have been employed to acquire inputs from key players. Authentic databases have been used for sourcing information about recent strategic developments of each market player. Dynamics of the local, regional and global manufacturers have been interpreted. First-hand information on future undertakings of competitors is also offered in the report. The competition landscape on global fortified sugar market has been illustrated in an unbiased manner. Assessing this substantiated information can be of great value for market players interested in treading ahead of their current market standings. Food technology has advanced in leaps and bounds, propelling the fortification of key food constituents such as sugars with essential nutrients like minerals and vitamins. Since its inception in the mid-1970s, fortification of sugars has gained grounds across the global food industry. Effective production techniques are being employed by companies to increase profit margins associated with fortification of sugars. Governments are enacting legislations and promoting the market exposure of such sugars by implementing sugar-fortification programs among food industry leaders. In addition, the growing undernourishment of populations is further compelling regional governments to magnify the fortification of sugars with vitamins, minerals and other micronutrients. 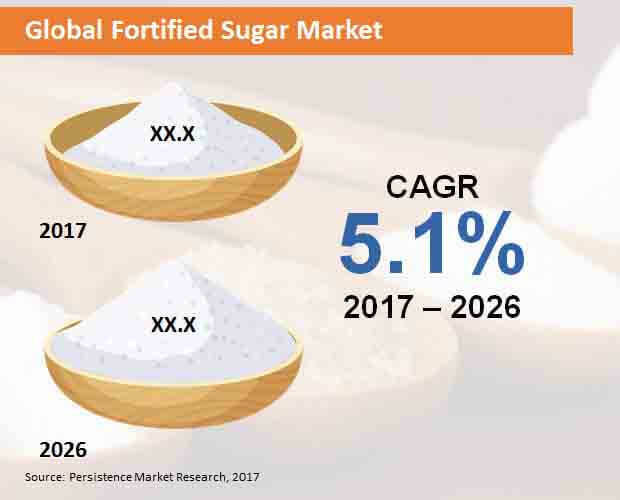 Persistence Market Research’s latest forecast report on the global fortified sugars market assesses that more than US$ 9.6 Bn worth of fortified sugars will be sold globally by the end of forecast period, 2017-2026. During this period, the global fortified sugars market is forecasted to expand at a steady CAGR of 5.1%. Companies partaking in the expansion of global fortified sugar market are focusing on adopting cost-effective fortification procedures and capitalizing on growing popularity of wellness trends among consumers. Increasing deficiency of vitamin A registered across the globe has spurred the demand for sugars fortified with essential vitamins. Governments are encouraging their populations to extend the consumption of sugars fortified with vitamins to battle the rising malnourishment levels at microscopic levels. In 2017, more than US$ 2.7 Bn worth of sugars fortified with vitamins are estimated to be sold globally. The demand for vitamin as a key fortifying micronutrient is expected to witness steady traction, while minerals will register a high value CAGR in the global fortified sugar market during the forecast period. Through 2026, fortified sugars will be predominantly produced with drying technology. The report estimates that by the end of the forecast period, drying will emerge as a sought-after fortification technology, procuring a global market value share of approximately 48%. In 2017, nearly one-third of fortified sugar sales registered in the global market were accounted by modern trade outlets. The report projects that modern trade outlets will represent the largest sales channel for fortified sugars. However, through 2026, the sales of fortified sugars through online stores, convenience stores and departmental stores will register fastest traction, reflecting a value CAGRs of more than 6% correspondingly. Likewise, the report further projects that the commercial end-use of fortified sugars will bring in more than US$ 5.2 Bn by 2026-end. Leading producers of fortified sugars have been profiled in the report, which include General Mills, Inc., Bühler AG, Bunge Limited, Cargill Incorporated, BASF SE, DSM, Wilmar International Ltd., Tereos, Sudzucker AG, Associated British Foods, Cosan, Nordzucker AG, and Mitr Phol Sugar Corporation. Ltd. Majority of these players are pegged to expand their production facilities in the Asia-Pacific excluding Japan (APEJ) region. APEJ countries such as China and India are prominently observed as lucrative marketplaces for fortification of sugars. Easy procurement of raw materials, vast consumer base and favorable industrial regulations will continue to draw these players towards the APEJ fortified sugar market in the foreseeable future. Mitr Phol Sugar Corporation. Ltd.